A marathoner who reached an early milestone and an American teenager who is dominating canoeing and kayaking nationally won the United States Sports Academy Male and Female Athlete of the Month honors for May. 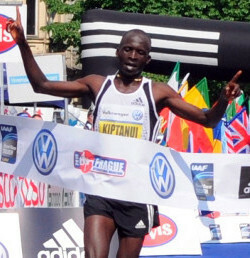 Eliud Kiptanui of Kenya was named Male Athlete of the Month after he set a track record, winning the Prague International Marathon in 2:05:39 in only his second marathon. Despite running on a difficult course with several kilometers of cobblestones, the rookie beat the course record by more than two minutes with the sixth-fastest time of the year for all marathons (17th all time). This all occurred less than a month before his 21st birthday. Hailey Thompson, 16, of Stevens Point, Wisc. 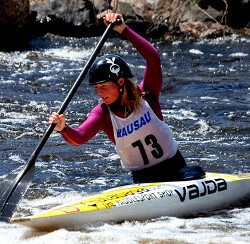 was named Female Athlete of the Month after she dominated the C-1W (singles canoe) Class, claiming 1st place in both the Junior & Senior competitions at the combined 2010 USA Junior & Senior Team Trials for slalom canoe and kayak in Wausau, Wisc. She will represent the U.S. this summer in the International Canoe Federation World Cup competitions at Prague, Czech Republic and La Seu d’Urgelle, Spain, the Junior World Championship at Foix, France, and the Senior World Championship in Tacen, Slovenia. Philadelphia Phillies pitcher Roy Halladay finished second on the male side after pitching the second perfect game of the season and only the 20th in the history of Major League Baseball. Hallady is 8-3 this season with a 2.03 ERA and 77 strikeouts in 93 innings. Daniella Ryf of Switzerland finished second on the female side after winning the second leg of the International Triathlon Union (ITU) World Triathlon Championships in Seoul, South Korea with a time of 2:00:59. Professional basketball star Kobe Bryant finished third after the Los Angeles Lakers’ guard averaged 29.4 points per game in the Western Conference playoffs, leading his team to its third consecutive trip to the NBA Finals. College lacrosse player Sarah Mollison finished third on the women’s side. The University of Maryland’s attacker had three goals and one assist to lead the Terrapins back from a 6-0 deficit to dethrone five-time defending champion Northwestern in the finals NCAA women’s lacrosse finals.